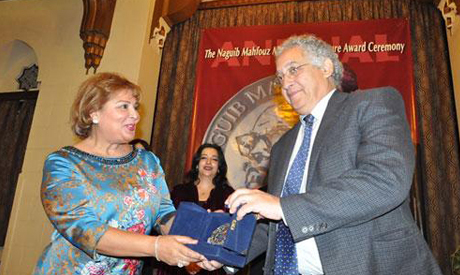 Syrian writer Khaled Khalifa has won the 2013 Naguib Mahfouz Medal for Literature. The prestigious literary prize, awarded by the American University in Cairo, was given to Khalifa for his novel La Sakakin fi Matabekh Hazehi Al-Madina (No Knives in this City's Kitchens), released earlier this year by Cairo-based Al-Ain publishing house. The announcement took place Wednesday at the Oriental Hall at AUC's Tahrir Campus. Since the prize's inception in 1996, the award has always been given out on 11 December, the day Mahfouz was born over 100 years ago. It is awarded on the basis of a work's literary excellence, as agreed upon by a panel of judges. This year's panel of judges included: Tahia Abdel Nasser, professor of English and comparative literature at AUC and granddaughter of late president Gamal Abdel Nasser; Shereen Abouelnaga, professor of English Language, Cairo University; Mona Tolba, professor of Arabic literature, Ain Shams University; Hussein Hammouda, visiting associate professor of Arab and Islamic civilizations at AUC; and Abdo Wazen, Lebanese poet and literary editor of Al-Hayat newspaper. Khalifa's winning novel is about the price that Syrians have paid under the rule of the Baath party, headed by embattled President Bashaar Al-Assad. Due to the current situation in Syria, however, Khalifa was unable to attend the awards ceremony in Cairo on Wednesday. Journalist and writer Sayed Mahmoud accepted the award on his behalf, reading a speech written by Khalifa. The speech discussed the feasibility of writing amidst the atrocities and death in his native Syria. Khalifa also admitted his debt to Mahfouz, widely known as the most popular Arab author and winner of 1988's Nobel Prize in Literature. Mahfouz died in 2006. Born in Aleppo in 1964, Khalifa is also the author of Madih Al-Karahya (In Praise of Hatred), one of only four Arab novels included in the website List Muse's best 100 novels of all time. Egyptians have won the prize more than any other country, claiming the award 11 out of 19 times since its inception.